In his dystopian novel 1984, the writer George Orwell described a new language being developed by the ruling regime of Oceania to control the thought and expression of its citizens. This language was called Newspeak, and was designed to limit freedom of thought and prevent potentially subversive concepts such as freedom, equality, democracy and peace from being utilized in articulating dissent. Accompanying this new language was a new thought process, Doublethink, which essentially involves accepting two contradictory ideas or notions about something without being aware of the inherent contradiction. Cognitive dissonance does not exist in Doublethink, and since the thinker will never be exposed to dissent through ordinary language due to the use of Newspeak, the combination of the two was expected to make it possible for the regime to control the thoughts of its intelligentsia without any direct intervention whatsoever. Orwell’s work has never been more relevant than now. We live in truly bizarre times. The meanings of words have changed to such a degree that it is no longer possible to be completely sure what anyone means. The oppressors have become the oppressed, the victims have become the perpetrators, and the privileged have claimed the mantle of the downtrodden. Even in the face of the glaringly obvious, it has become possible for people to claim ignorance and to pick and choose what they wish to believe. Facts are now negotiable. Reason and empathy have ceded ground to irrational hatred and hypocrisy. We have no need for an organised regime to produce newspeak and doublethink for us. Both are coming into existence on their own through the machinery of modern media, as it gives voices to the most regressive and hateful of us. On August 1, 2015, the Akhil Bharatiya Vidyarthi Parishad (ABVP) disrupted the screening of Muzaffarnagar Baaki Hain, a documentary on the 2013 Muzzaffarnagar riots, at Delhi University. 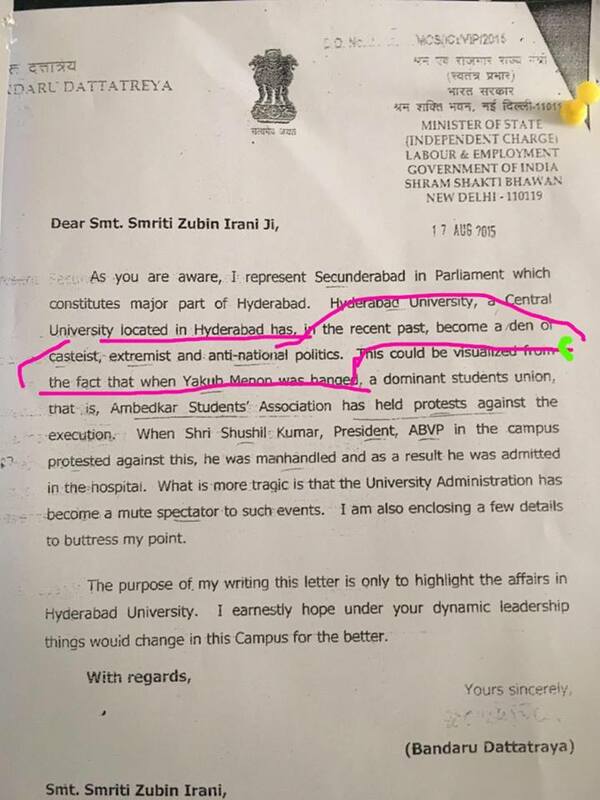 On August 3, in the University of Hyderabad, the Ambedkar Students Association (ASA) decided to stage a minor protest against this disruption, which led to a brief altercation on Facebook between the five students and the leader of the ABVP, Sushil Kumar. As this article clearly points out, there was no funeral prayer for Yakub Memon and Memon’s name was added to the issue only later on. This was resolved within the university amicably and the complete details of what transpired can be found here. On August 4, a complaint was filed with the police against the students by someone allegedly unconnected with the entire incident, according to the Chairperson of the National Commission for Scheduled Castes, P.L. Punia. A BJP MLC, Ramachandra Rao, met the former Vice-Chancellor and asked that action be taken against the ‘anti-national’ dalit students. False claims were made about the students having manhandled the ABVP leader. An inquiry committee was instituted that found no hard evidence against the students. In spite of the lack of evidence, the Proctorial Board decided to take action against the five students claiming that they had manhandled the ABVP leader. Then Vice-Chancellor R.P. Sharma revoked the decision and instituted a new committee to pursue a fresh inquiry. However, the new V-C, P. Apparao, went ahead and had the students suspended. Casteism is now a new word that refers to those who mention the discrimination they face. To protest caste discrimination is to be a casteist. 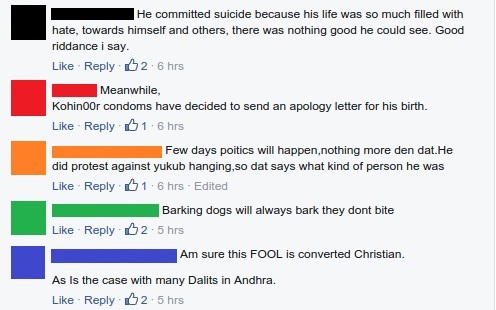 You are a casteist, if as a dalit you choose to highlight your plight. Merely mentioning the status accorded to you as a lower caste is now casteist, according to this new meaning. By calling yourself a dalit, you are now ‘polarizing the country and trying to divide it’. More specifically, expressing opposition to the death penalty, something that every citizen is entitled to as a right to freedom of expression, is now an anti-national activity, especially if the penalty applies to a terrorist. The word anti-national, like seditionist and traitor, is now used not to describe activities that directly threaten the nation, but rather those that threaten a narrow-minded ideology of chauvinistic hatred. Words have changed meanings again, referring to completely new things. Most importantly, criticising casteism, superstition and other deeply entrenched social evils in Hinduism has become synonymous with criticism of Hinduism. And criticism of Hinduism is now criticism of India itself, which is anti-national. Critics of Hinduism are therefore anti-nationals. These three examples are just the beginning of a new kind of language that is now widespread and very popular with the privileged and self-righteous patriots. Dissent and constructive criticism are now impossible without the accusation of being a seditionist, since the language to articulate that dissent has been effectively hijacked. In this we can identify Orwell’s idea of newspeak. As if this wasn’t enough, the learned Hindu intellectuals of the internet did not spare any invectives for this innocent man. 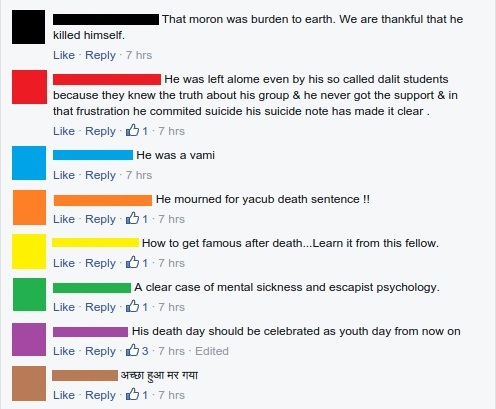 Many initially chose to call him a coward for committing suicide, a classic example of victim blaming that is so commonplace for a society that lacks any empathy for victims of depression. A standard argument at the tip of every savarna ignoramus’s tongue, as is evident from articles like this one, is the idea that a university is only a place for studying, and not for voicing ideas or critical political thinking. Students at universities should shut up and study. They shouldn’t be allowed to question the status quo and express their displeasure through non-violent protest. They should accept injustice meted out to them as some kind of twisted disciplining exercise, meant for their own benefit. In the eyes of these modern sanatanis, educational institutions are very much like the temples: bereft of anything but pure and slavish devotion, and exclusively meant for those with the right gunas. Most of all, they maintain vehemently that students should never question religion and country, the two now rapidly being venerated in much the same way. Very soon, the internet right-wing went all out, publishing all kinds of patently false, obscurantist hand-wringing that condoled his death while using it as an opportunity to lie about Dalit activists, claiming yet again that they are out to ‘divide the country’. Some chose to completely ignore that this was undeniably a case of casteism in higher education, and maligned him for his opinions. 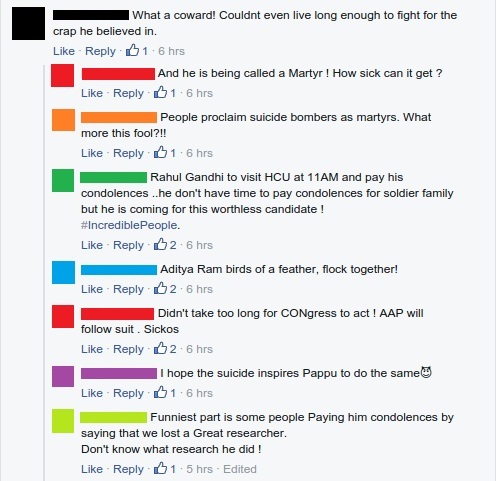 After all, he spoke the language of dissent, and since it has all been hijacked, he was already an anti-national traitor. All that remained was for his life to be ruined by his suspension and push him over the edge. Even now as we speak, there are attempts to claim that he wasn’t even a dalit, another claim that demagogues have made based on whatever distortion they could attempt with the facts. If there was any doubt in anyone’s mind as to whether casteism exists in 21st century India, it would be sheer doublethink to believe otherwise. 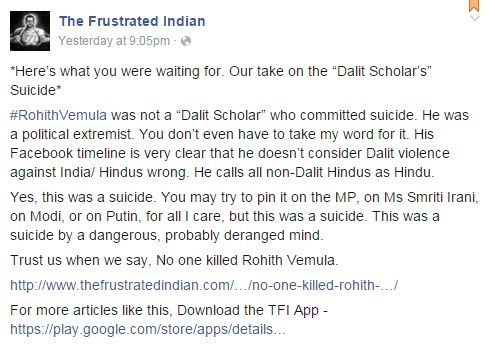 Numerous documented cases of casteism and dalit student suicides in higher education are available for all to see. 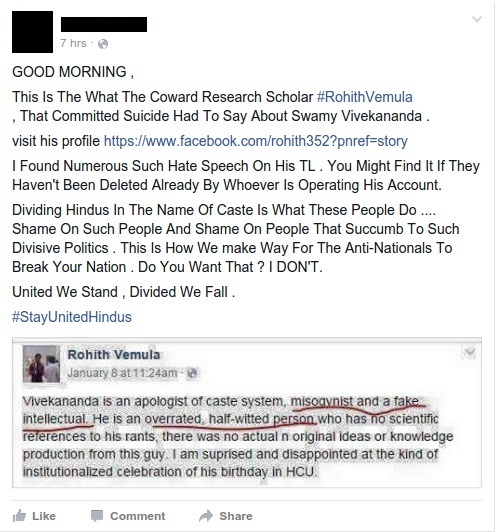 But doublethink is now second-nature to the vast majority of internet Hindus, who rant against caste reservation claiming it promotes casteism, which they are supposedly against, while reserving the most venomous hatred for dalit students who dare to raise their voice and say things they don’t agree with. This doublethink pairs well with the new casteist newspeak that is now in use everywhere, be it in politics, in the media, on the internet or in our everyday conversations.